The Frankenslot’s Monster slot machine is an interesting new take on an old tale. BetSoft’s Frankenslot’s Monster slot takes the tale in a new direction. Let’s face it, when BetSoft decided to call their latest game the Frankenslot’s Monster slot, there will have been a few of us who groaned. It is hardly the best name for a slot, is it? Once you look past the dodgy name, and see the graphical quality, the wagering range, and bonus features in this slot, though, you’ll be more than content enough to give it a whirl. 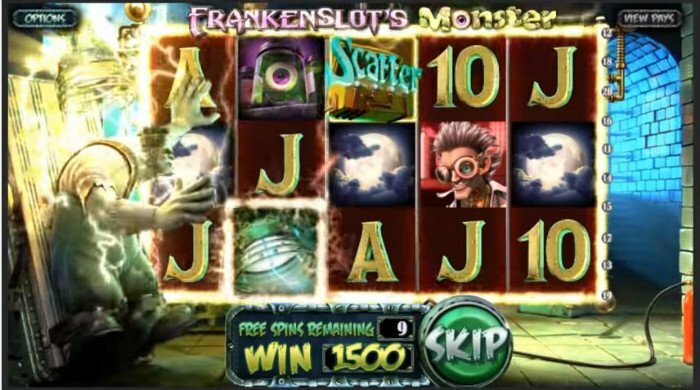 We should start this Frankenslot’s Monster slot review by looking at this great graphics. As usual, BetSoft Gaming has delivered when it comes to the Frankenslot’s Monster slot graphics. They are exciting, they are vibrant, and they are very fitting to the narrative told in this 5-reel, 20-line game. Frankenslot’s Monster would be half the slot it is without those graphics. So, how much are you going to have to wager on the Frankenslot’s Monster game? BetSoft will permit you to adjust your coin values, and the number of coins you stake per line, but not the number of paylines. Minimum stakes will always cost 20p a spin, whilst maximum stakes are forever fixed at £100 a spin. The Frankenslot’s Monster slot machine has a number of more than decent special features, as we’ve discussed. These are triggered via three different symbols. First up are the wilds. Wild symbols appear as lightening bolt-style text, and can replace all other symbols in the slot, save for scatters and bonus icons. Wilds also happen to be the best paying symbols in the game, and can result in you winning a non-progressive jackpot of 5,000 coins if you land 5 on a payline. Receiving 3 scattered bonus icons (they appear as lever panels) on the first, third, and fifth reels of the game will trigger the feature. 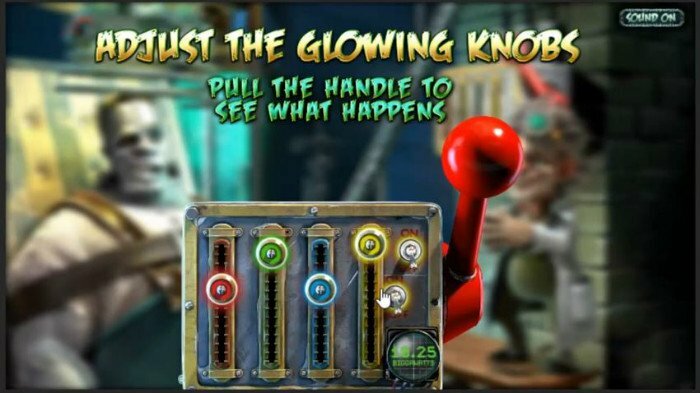 In the bonus, players can adjust the setting on the panel displayed on the screen to trigger a shock which is sent to the monster. Players can win as much as 25x their total bet with this bonus. 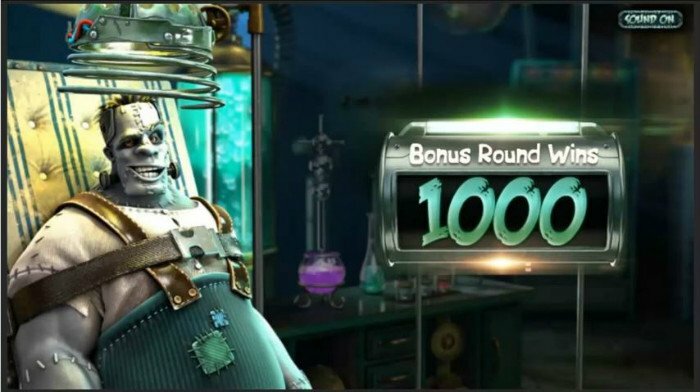 The best of all the Frankenslot’s Monster bonuses is the free spins feature. This is triggered when a player lands 3 scatter icons on the second, third, and fourth reels of the game. Players will start the bonus with a total of just 8 free spins. Between one and three random wild symbols will appear on the reels during the bonus, and if players land more scatters on the reels, they can win additional free spins.